Palm Beach Gardens and Jupiter, rated to have the top ten golf courses by Links Magazine, are home to a large country club community. Being equipped with state-of-the-art facilities, country clubs present an active and privileged lifestyle. Consequently, many professional golfers choose to reside in these areas. Residences have amenities such as pool, tennis, spa, golfing, and arranged social activities. Country clubs exceed the definition of “community” by bringing members together to enjoy this way of life in a well-organized manner. Every country club has a personality of its own. Located in Jupiter, the Ritz Carlton focuses on golf by featuring the Jack Nicklaus Signature Golf Course. Most residences choose this community for the golf scene. Conversely, Admirals Cove is delicately nestled along the natural tropical waterways, creating options for both golf and waterfront living. 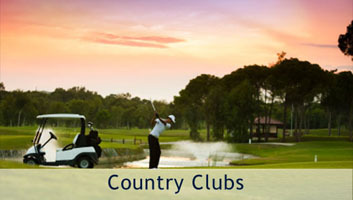 Please contact one of our team members to find a country club that fits your preferences.